San Rafael, Calif.—Domestic table wines priced at $20-plus grew faster than any other bottled wine category during December. They beat the year-ago figure by 26% and reached $24.7 million in revenue at major U.S. food and drug stores. During the previous 52 weeks, the growth rate in this price category ran even higher, 29%, totaling $191 million in sales. The price-point of $20-plus is the highest that Symphony IRI (SIRI) breaks out when analyzing check stand scan data from stores. While there is a tendency to think that this category’s hot growth reflects a recovery from the recession and bank crisis of 2008, the numbers don’t bear that out. 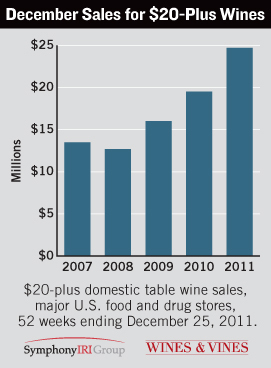 High-priced wines recovered immediately in 2009 and then grew to new heights in both 2010 and 2011. Domestic table wines at all price-points grew 8% over a year ago in the four weeks ending Dec. 25, 2011, according to SIRI, a Chicago-based market research firm. Sales reached $448 million over four weeks, and $4.69 billion over 52 weeks, a 7% annual growth rate. Among varietal table wines selling for $20-plus in both domestic and imported categories, Cabernet Sauvignon had the highest 52-week sales at $64.5 million, while also increasing at the second-highest rate of the 10 most popular varietals, 35%. Pinot Noir continued to grow the fastest. Its sales expanded by 43% and reached $22.4 million. Chardonnay is the second-biggest varietal in dollars at $20-plus, and it grew at a very respectable 18%, while even supposedly boring Merlot went up by 12%. 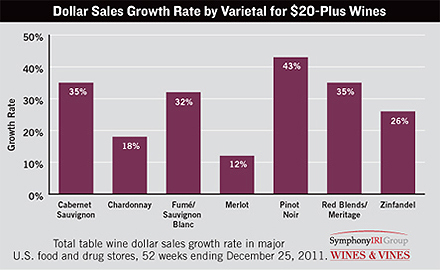 Syrah/Shiraz may be shrinking by double-digits at other price-points, but the high-end wines grew 16% over 52 weeks. Remember red Zinfandel? Its sales were only $7.5 million over 52 weeks, but this was a nice increase of 26%.